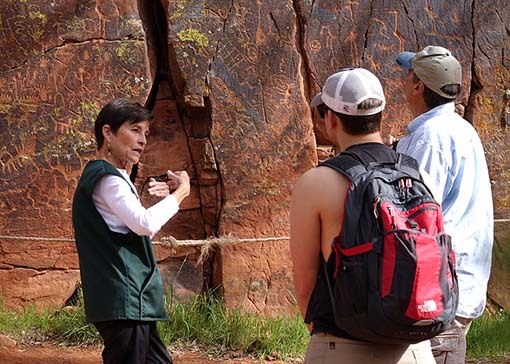 The Cultural Resources Committee was formed in September 1995 in response to a growing problem with graffiti in the Verde Valley at cultural heritage sites such as Palatki and Red Cliffs. Today members of the Cultural Resources Committee provide assistance to the at Palatki/Red Cliffs and V-Bar-V. This assistance is in the form of docents who provide information to visitors about the ancient cultures that once lived at or visited these sites. Members of the committee also aid in the preservation and protection of these prehistoric sites. As a result of their duties, committee volunteers become well versed on the prehistory and early pioneer history of the Verde Valley. Click here for answers to common questions regarding becoming a Cultural Heritage Site Docent for V-Bar-V and Palaki. 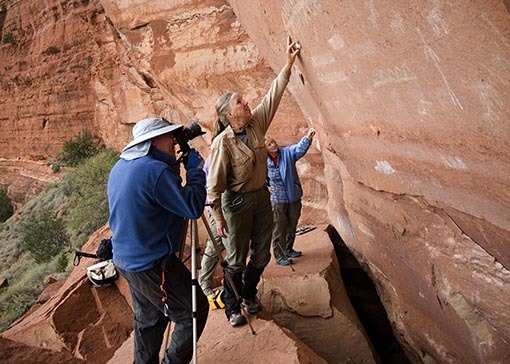 The Site Photography Team creates photo documentation of archaeological sites. This detailed imagery allows current site conditions to be compared to past and future photos and descriptions of the sites. The Site Recording Project Team creates detailed reports of archaelogical sites including site sketches, ceramic sherd analysis, lithics analysis, rock analysis, and topo maps. Interpretative reports are then created. Explore some of the activities we have available by clicking on the links below.